Konus Tripods are affordable supports for Konus spotting scopes, cameras, and binoculars. They have both 3-sectionand 4-section aluminum models and a 3-section magnesium model. 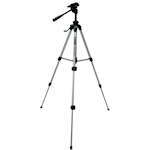 The magnesium model has a detachable leg that can be converted into a monopod.